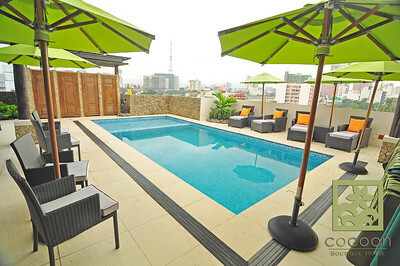 Cocoon Boutique Hotel has just made Quezon City more luxurious and definitely greener. 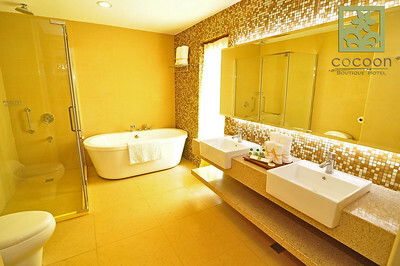 It is a wonderful idea really, to mix intimate, classy, globally-competitive and yet truly Filipino and use environmentally-friendly materials to build a getaway for the harried and the transient. The location can't be beat as well. 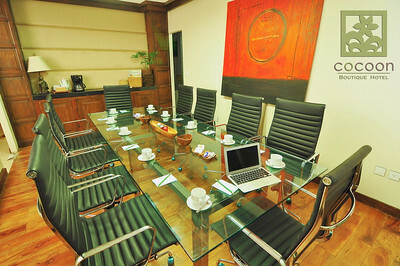 Located at Scout Tobias corner Scout Rallos (streets in this area of Quezon City were named after Boy Scouts who perished on their way to a World Jamboree back in 1963), the boutique hotel is just a few blocks away from the bustling entertainment and food scene that are Tomas Morato, Timog and Mother Ignacia. 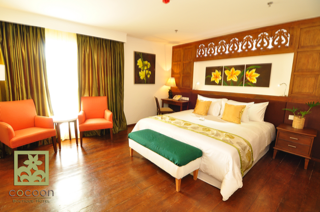 Cocoon Boutique Hotel boasts of stylish 5-star amenities with a staff that were extensively trained. 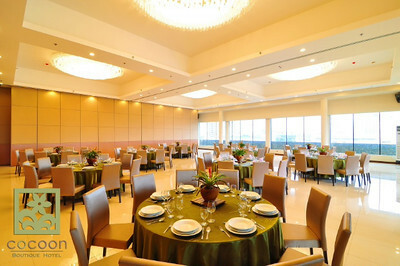 Apart from the design of the hotel that maximized natural ventilation and lighting, they also provide a venue for community-immersion for youth with disabilities. 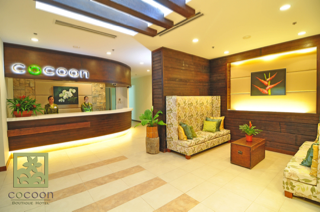 And how is Cocoon Boutique Hotel green? 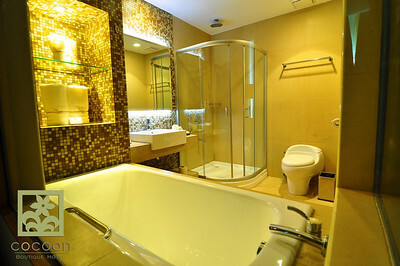 Why, it uses harvested rainwater for toilet flushing, plant irrigation and general cleaning. The building used reclaimed wood and metal from demolished sites and uses 100% LED lighting. And how is it Filipino? I guess you just have to enjoy the calado woodwork, antiques and paintings in the hotel. Truly, luxurious cannot be more responsible. It's hard to imagine that they used reclaimed wood for the lobby as well as used lighting fixtures. Notice the skylights for natural lighting. Water-saving faucets, dual piping for poable and grey water... as well as 100% organic bathroom amentiies (with toilettries made from plasticized cornstarch and packed using stone paper and soy ink). 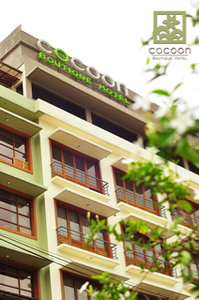 Entertain, do business, party, celebrate, romance or relax in splendor because Cocoon Boutique Hotel offers a deck bar, coffeshop, ballroom, board room, business center, gift shop, Italian restaurant, tea and pastry shop, a salon, travel agency and aesthetic clinic.